The whole world’s population is set to take part in Earth Hour – an annual event designed to draw attention to wastage of resources. This year, Moscow’s Kremlin joins in, with electricity to be switched off for an hour in the heart of the Russian capital. 08:00 GMT: RT is wrapping up its live Earth Hour coverage: more than 7,000 cities in over 150 countries successfully participated to raise environmental awareness, which set a new record. According to the event organizer World Wildlife Fund (WWF), Palestine, Tunisia, the Galapagos Islands, Suriname, French Guiana, Saint Helena, Rwanda participated for the first time this year. Also, Russia’s Kremlin and Red Square joined in the action for the first time. 02:30 GMT: Light go out at the Monumento a la Revolucion in Mexico City, Mexico. 00:30 GMT: New York City joins in as lights were turned off on Times Square and the Empire State building. 21:30 GMT: The skyline of Rotterdam with the Erasmusbrug before and during the Earth Hour. 21:30 GMT: Paris's Eiffel Tower also switches off its lights. 22:30 GMT: Athens join the Earth Hours with its iconic ancient Temple of Parthenon atop the Acropolis plunging into darkness. 19:01 GMT: Palestine has joined the Earth Hour, with switch offs taking place in Gaza City and the cities of Nablus, Bethlehem and Ramallah. “We want to show that world that if Palestine, one of the most vulnerable communities in the world, can take action against climate change then it’s an indication that we can actually work together to save the planet,” Sara Suwwan, organizer of Earth Hour in Nablus City, is cited by the action’s official website. 18:08 GMT: Egypt seems to be in a rush to join the global action, going dark ahead of schedule… due to power supply problems. — Ahmed El Demery (@Demery_) 23 марта 2013 г. 17:46 GMT: Madagascar, Uganda, Kenya, Kuwait, Bahrain, Qatar, Jordan and Belarus have turned off the lights as part of the Earth Hour. 16:15 GMT: Kremlin turns lights off for the first time this year as Russia contributes to the Earth Hour. President Vladimir Putin will take part in the event, turning off the lights at 8.30pm – the time the event is scheduled to commence all across the globe. The lights will remain, though, on the Kremlin clock and the Russian flag and glowing red stars atop its towers, a spokesman for the presidential administration, Viktor Khrekov, told RIA Novosti. Ninety more architectural landmarks of Moscow, including the famous Moscow State University building, are set to turn off their lights for an hour. Russian astronaut Roman Romanenko, currently part of the team at the International Space Station, appealed for broad support of the event in a video statement posted on YouTube. "From here in space we can see very well how much our planet needs protection," he said. 16:00 GMT: Armenia has switched lights off as the country joins the Earth Hour for the fifth time. 15:20 GMT: The UN will take part in Earth Hour by turning off the lights at its offices around the world today, March 23. 14:49 GMT: Nepal has switched off lights as Earth Hour comes to the country. Lights have also been turned off all over Sri Lanka. 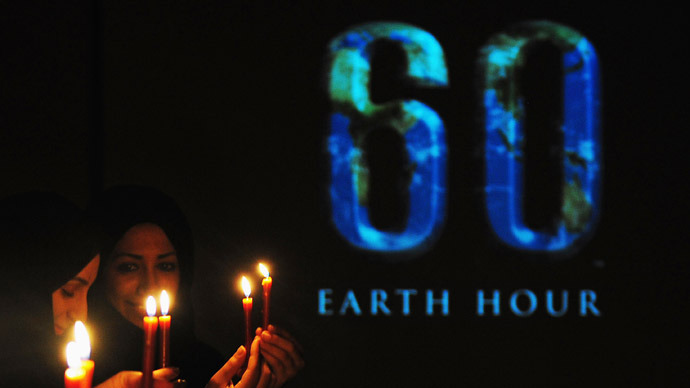 14:30 GMT: Bangladesh, Bhutan, Kazakhstan and Kyrgyzstan have joined Earth Hour. In total 150 countries are expected to join the event as it moves around the planet. 14:00 GMT: Singapore's skyline plunges into darkness for Earth Hour. In total, more than 100 buildings around the city center took part in the event. 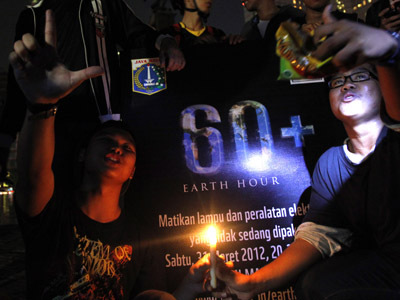 13:40 GMT: Cambodia, Thailand and Vietnam have joined Earth Hour following Indonesia. 13:30 GMT: Jakarta’s City Hall, street lamps, fountains lightening and billboards have turned lights off as Indonesia joined energy-saving Earth Hour. 12:47 GMT: China’s Taipei 101, the first building in the world to break the half-kilometer mark in height, turned completely dark as the Earth Hour started across the country. 12:34 GMT: The Petronas Twin Towers in Kuala Lumpur, a Malaysian landmark, have gone dark for an hour. 12:30 GMT: The Philippines have joined Earth Hour. — James Benoza (@jamesbenoza) 23 марта 2013 г. 11:00 GMT: In Seoul, South Korea, Namsan tower, a 63 story building, and other major buildings went dark after the country joined Earth Hour. — 시몬스 (@asdde96) 23 марта 2013 г. 10:00 GMT: Sydney's skyline plunged into darkness as the city shut down its lights for the Earth Hour campaign against climate change, starting a planet-wide event. 09:00 GMT: RT gives you live updates as countries around the globe one by one are to join the Earth Hour campaign. Earth Hour is an annual international event aimed at attracting attention to the problem of waste of resources and global climate change. Launched in 2007 in Sydney, Australia, it soon caught on and is now conducted by the WWF in 150 countries. Critics say that it could lead to an increase in carbon emissions and place great strain on electricity grids. What’s more, many experts say that the move essentially compares environmentalism with “living in the dark” and has little to do with helping the planet become ‘greener’.